NASHVILLE, Tenn. (April 8, 2015) – KANSAS, one of the most iconic Rock ‘n’ Roll bands of all time will continue to forge their musical legacy by signing with APA for worldwide representation to bring their unique sound to fans around the globe. Band members Phil Ehart, Billy Greer, David Manion, Ronnie Platt, David Ragsdale, and Richard Williams are looking forward to keeping their one-of-a-kind music on the road. Miracles Out Of Nowhere, a new, in-depth documentary chronicling the legendary band’s beginnings and rise to fame, premiered in February at the Santa Barbara International Film Festival, and made its television premiere on both VH1 Classic and Palladia on March 20. The film and companion CD was released on March 23 and debuted at #37 on Billboard’s Album Sales chart and at #61 on the Billboard Top 200. KANSAS’s first public statement appeared on their self-titled album in 1974. “From the beginning, we considered ourselves and our music different and we hope we will always remain so.” Little did this legendary rock group realize that back in the early ‘70′s, what seemed to be “different,” was actually ahead of its time. 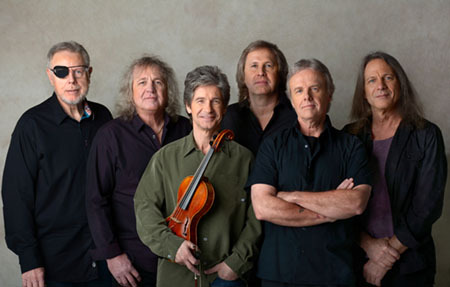 With over 30 million records sold, the band has produced eight gold albums, three sextuple-Platinum albums (Leftoverture, Point of Know Return, Best of KANSAS), one platinum live album (Two for the Show), and a million-selling gold single, ‘Dust in the Wind.’ KANSAS appeared on the Billboard charts for over 200 weeks throughout the ‘70′s and ‘80′s and played to sold-out arenas and stadiums throughout North America, Europe and Japan. ‘Carry On Wayward Son’ was the #2 most played track on classic rock radio in 1995 and went to #1 in 1997.